PhoenixMotorsport is always looking for new ideas and products to improve the pleasure that enthusiasts get from their cars. From cosmetic enhancements to track bred modifications, our staff and customers always have a new project idea for our engineering staff to consider, and often dismiss! Our aluminium door pins were originally made from an offcut of pure Titanium that was kicking around the workshop. A bit of an extravagance that ended up going into production as our machined billet Aluminium door pins, then the dipstick handles to practice programming the new CNC milling machine, and the adjustable anti-roll bar (sway bar) drop links to allow correct bar pre-load, and so the list grows. Originally made as an experiment in programming the new CNC machine, the aluminium dipstick handles are a brand new product, not available anywhere else as far as we are aware, and are designed as a direct replacement for the plastic handled dipsticks which tend to get brittle and break with age. Currently machined from a single billet of aircraft grade aluminium, these handles are virtually indestructible and come, where appropriate, with new sealing rings. They can be supplied complete outright or on an exchange basis where we as yet do not have a pattern or where the customer does not wish to install the handle to their own original dipstick. 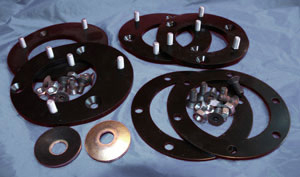 Originally designed by MWrench in the United States, these camber adjustment plates, (shown here for the BMW E31 8-Series and E24 6-Series), adjust the front suspension camber to a new fixed position to greatly improve handling and reduce understeer on these vehicles. 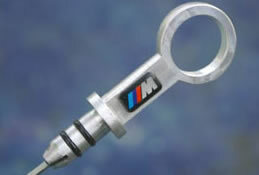 Also available for the E36 3-Series in 2 stages complete with bearings, stage 1 for street and stage 2 for superstreet or track. (stage 2 will show an increased front tyre wear rate) Also available for the E36 and E31 are uprated rear strut top mounts and reinforcement plates.